Osteoarthritis (OA) is a joint disease that is typically seen in middle-aged to elderly people and will worsen over time. It is characterised by breakdown of the cartilage, changes of the joints, deterioration of tendons and ligaments, and various degrees of inflammation of the joint lining. These structural changes can occur at multiple joints, and may not be accompanied by symptoms, which makes the diagnosis of OA difficult. It can be characterised into radiographic, symptomatic, and diagnosed types. GlobalData’s epidemiology analysis of OA prevalence in the US found large differences in prevalence rates depending on the disease definition, showing that the majority of OA cases are not diagnosed. 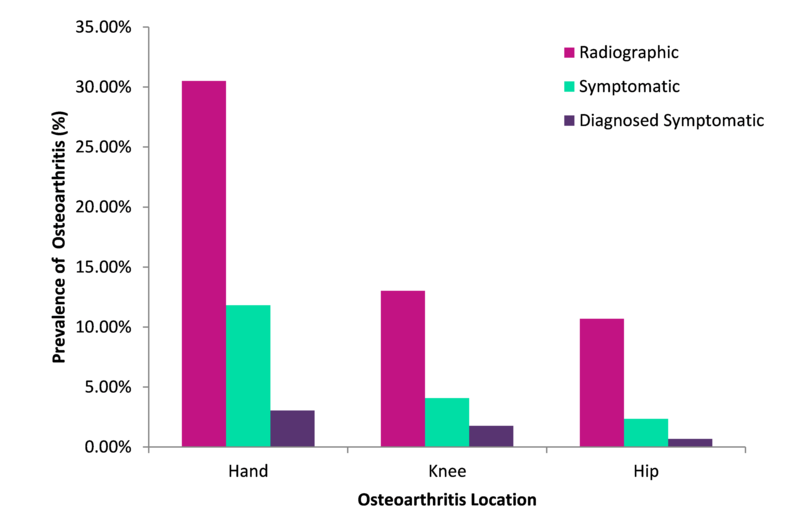 Figure 1 shows the prevalence of OA by disease definition (radiographic, symptomatic, and diagnosed symptomatic) in the US among adults aged 18 years and older in 2016. GlobalData epidemiologists found that for the hand, radiographic OA prevalence in this population is around 30%, while symptomatic hand OA prevalence is less at around 12% and the prevalence of symptomatic hand OA that is diagnosed is significantly less at 3%. The same trends are seen in knee and hip OA in the US. Radiographic OA is characterised by the presence of osteophytes (outgrowths of bone at the margin of the joint). The severity is graded according to the Kellgren-Lawrence (KL) scale. Studies that report the prevalence of radiographic OA used population-based screening tests to determine if a person shows signs of joint disease regardless of whether they were symptomatic. This can be considered to be an estimation of the true disease burden of OA. The majority of these cases are in the early stages of OA where only the cartilage is affected. Since cartilage contains no nerves, this disease can go unnoticed. According to GlobalData’s analysis, 10% of those with radiographic hand OA are diagnosed, resulting in a diagnosed prevalence of 3%. The ability to detect OA early is a major area of unmet need identified by GlobalData healthcare analysis, since early intervention will reduce long-term morbidity and decrease the healthcare resources needs. Cartilage-derived biomarkers may be potentially useful in fulfilling this need. For more details about the epidemiology of osteoarthritis, please see the newly published EpiCast Report: Osteoarthritis – Epidemiology Forecast to 2026. For more details about the treatment paradigm of OA, please see the newly published OpportunityAnalyzer: Osteoarthritis Opportunity Analysis and Forecasts to 2026.